Most enterprise wireless infrastructure is indoors – offices, warehouses, factories, retail outlets. The big venues are mostly covered, and they are often celebrated as models of the success of IBW. The biggest challenge for IBW today is in the middle-sized enterprise – also referred to as the middleprise. I talked to Werner Sievers, CEO at Nextivity, about how Nextivity strives to meet the requirements of the middleprise and of the operators trying to serve it. To address the needs of the middleprise market, Nextivity “bring[s] a class of technology that has only been seen in big venues down to the middleprise. Also, if you refer to the model today for in‑building wireless installs – in other words, high‑frequency building installs – these are all being done by skilled system integrators or installers,” Werner said. 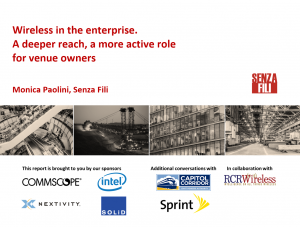 Join us for a webinar discussing the report “Wireless in the enterprise. A deeper reach, a more active role for venue owners” on October 31st, 2017 at 9:00am PT, 12:00 PM ET, 5:00 PM GMT, 6:00pm CET.